The Team was off air last week attending conference week. The weather played its part but interestingly, not so much in Dunedin which was wet and cool, but not the snow or winds of the rest of the New Zealand. Our two award ceremonies were magnificent – full of Scottish pomp and circumstance with the appropriate lashings of whiskey for the haggis honour guard. Award winners were largely speechless – recognition must go to Bob Cleland for the shortest NZAAA award recipient speech on record. A mere “thank you”, quite humbling from a man who has written one of the best Ag aviation books for keeping budding aviators pursuing a career in that environment alive. Additionally, one of our members and chairman of the Air Transport Division, Errol Burtenshaw, won the Director of Civil Aviation’s award for his contribution to aviation safety. Shortly thereafter, the ghost of Larnach Castle struck with an interlude of hail and sleet which at the hour before midnight sent our guests scurrying for the early buses. However, those not so quick witnessed the ghost strike again by disabling the last bus back to town – fortunately the fires were still burning and there was plenty of fine wine still to be consumed. A very quiet conviction and determination that each of us knows our part and understands the contribution we will make going forward. Next year’s conference returns to the North, in Napier from July 21-25. Over 1000 photos were taken at conference and these will be available very shortly. You’ll be able to download off our web pages. Ken MacKenzie after 20 years of service to the Association and a further two years to come after being reappointed as a Vice President of the AIA. This is our most prestigious award. Past recipients have been Spidertracks now the number one aviation tracking product for GA in the US; Altitude who design from new and remodel/refit aircraft interiors and Lanzatech recently recognised internationally by the award of a Green Oscar. This year Tracmap join this line up (click here). Fittingly, based in Dunedin this company has literally come onto the global stage with a series of very innovative and simple systems which can be used for precision application of fertilisers and toxic baits. Part of clan "venison" retrieval, Russell has had a long and magnificent career assuring us that his objective was to become the oldest commercial helicopter pilot in this country. Ably supported by life member Jim Love, Sir Tim and Lady Wallace and Ella Davidson, Russell and his wife, Teresa, were our guests at our Larnach Castle ceremony. We are delighted to be invited to join the Trust at a Black tie function on 10 August to present this award. The ability for the Trust to leverage receipt of the award for the purposes of fund raising adds to the level of support we are able to provide to the EMS sector. These two gentlemen from the Waikato region appeared almost inseparable with a massive 120 years of aviaiton engineering expereince between them. They work next door to each other at Eagle and Super air and look as they are both degearing for a long and fulling sojourn. The individual awards went to Ralph Etheridge of Eagle and John Muir Super air. A big thank you to every sponsor supporting the week (click here). 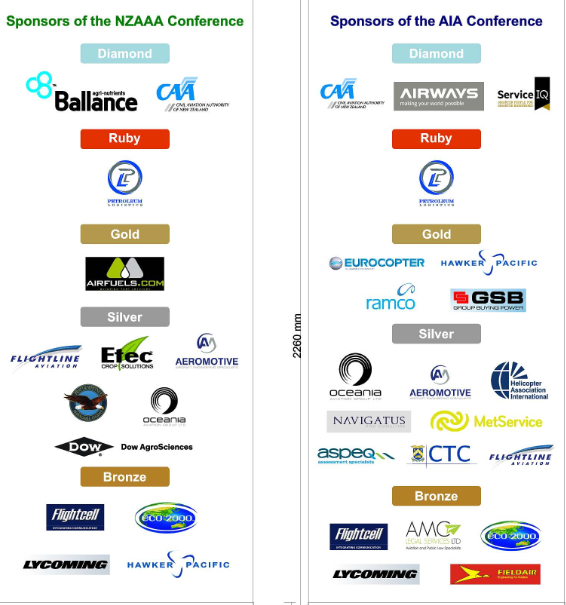 We run the conference at cost to encourage maximum numbers to attend and our prices have been held at 2009 levels - this can all be put down to the tremendous support we received from our very loyal sponsors and one or two new one. We'll also be giving our sponsors the opportunity to talk to you about their products and some of the recent developments. We need you to support those who supported us in the trades hall. Here's our trades directory with contact phone numbers and email addresses (click here). Networking is a major part of the show but there are some fantastic services and products on offer. In our newsletters each week we will be featuring one of our trade displayers and their products and get them talking about the value of conference - warts and all. Air Transport, EMS and TFO to become Operations. There is one caveat and that is divisions can opt out of the merger if that is so desired and this matter will be put to EMS and TFO members in the not to distant future. There has been quite a bit of activity since the mission finished on 24 May. Two mission participants were in Indonesia this week, following up prospects, another is there next week. An Indonesian company spent 3 days this week in New Zealand. We helped organise the programme for them. They met several agencies in Wellington which, from a government viewpoint, are responsible for the standards and conditions companies must comply with for international work. It was quite eye opening for the Indonesians to see just how integrated we actually are! We’re also familiar with some formal proposals that have now been sent by mission participants to Indonesian prospects, and the negotiation process is well under way. Good fortune to those companies! identified opportunities where NZ companies could be collaborating and working more closely together, especially with in-market contacts. This brings economies. We talked about some of these possibilities in the Growth Agenda sessions at conference. If you missed those sessions or would like to volunteer involvement in future activities, let us know. Submission to CAA – don’t forget risk based rule making AKA SMS introduction submissions due 9 July and there's the Omnibus rule with submissions due 28 June. Review Process of CA Act - excellent discussion at conference and a good briefing from MOT officials. The Minister Hon Michael Woodhouse speaking at an Airports function on Wednesday night said the Act was in for a tweak as opposed to major overhaul and we think that's probably about right. The old Airport Authorities Act however, appears possibly to be looking for a new home or going into rehab permanently. HSE Bill introduced into the House (click here) - an interesting discussion with a senior Labour MP in passing was a view that they saw more merit in specialist regulators in highly safety sensitive industries as the fix. When asked would this mean CAA our environment they said YES - consistent with their view of mining. Officials drafting the Bill don't appear to support this view. Fixed Wing instructors - B cats in retreat.....(click here) - the lynch pin of training and source of most airline pilots, the decrease in numbers is quite alarming and under present policy settings impossible to arrest. One question that springs to mind is should student loans fund the flight instructor stream only - is that a reasonable way of ensuring we have good career pathways for pilots. B cats are the essential element of our training system and without them it starts to unravel particularly as A cat numbers are pretty stable. Your thoughts??? Skill shortages - what next? Our Careers Expo, which needs some real fine tuning for next year, attracted around 100 plus expressions of interest. These are young people interested in joining our industry. However, the real challenge for us of course is having facilities and resources to train. There is no doubt that our flight training industry is in crisis - last year the boots thought it was stress - now I would put it at distress levels. Schools are surviving and providing excellent quality training for international students and the New Zealand pool contracts. We're in the process of scoping up the project and associated work with the help of a small working group with employer, flight training, ASPEQ and CAA involved. Once this is done, we'll be out to talk to you. At the moment we're thinking most of the work will be done in-house as it’s important to build firm collaboration between all key players. Landcorp has in recent years adopted a mandatory position that any fixed wing aerial agricultural operators must have NZAAA accreditation to operate on a Landcorp property. This now has been superseded by the introduction of Aircare which we subsequently have also endorsed and require total commitment to by operators. Some of your members will be aware that we are currently tendering much of the fixed wing work nationally and our tender document conditions require tenderers to be Aircare accredited. Only accredited operators will be allocated work under a formal contract. We are concerned that recent publicity has suggested that Landcorp is withdrawing from its commitment to Aircare. That is not the case. Landcorp continues to seek best practice in most aspects of its business. Agricultural aviation is no exception. Where the safety of a contractor is enhanced on our property and where Landcorp will be more assured of a professional job with proof of placement being a prime example of our requirements, then Landcorp will still insist on Aircare accreditation. Our second phase of instigating best practice for aviation operations on Landcorp properties is now to request that all helicopter operators that could be engaged in any assignments after 1 December 2013 will be required to have Aircare accreditation. I take this opportunity to thank aerial operators for their assistance to formally audit our airstrips and engage Landcorp in enhancing the operational standards of our facilities. Meeting with Minister Nick Smith - post DoC's announcement that the AIRCARE or equivalent issue was on hold until October we had an opportunity to meet with the Minister's and better understand his rationale and thinking on the issue. Minister Smith is a ‘less regulation better regulation’ proponent and he sees our programme as imposing additional costs and positioning him as a defacto aviation safety regulator. He accepts that Noise is a risk he must treat but doesn't see a need for a country wide programme. Whether his approach involves DoC reverting to its original stance of "we will ration and pick winners and losers " we shall have to wait and see. AIRCARE's philosophy was to provide assurance that heavy handed centralist intervention was unnecessary as DoC was dealing with responsible operators backed by robust independent assurance i.e. a partnership approach.